Having had a few weeks break due to work commitments I found myself considerably disorganized for this week’s run despite not working yesterday. However yesterday was a quagmire of domestic traumas: having to have my ring cut off (it had got too tight and my finger was swelling painfully), our computer having a ‘block on the hard drive’ as we tried to update the software (as the lovely Sam from Mac Ambulance kindly assured me), some feverish hoovering (partly down to the imminent arrival from the afore mentioned Sam and visitors arriving at the weekend – the sudden realisation that someone would see the domestic chaos filled me with shame and horror!) and a sudden compulsion to invite my neighbour in for coffee (probably to counteract the hoovering/marking pile) anyway – breath – with so much excitement I didn’t spend the time researching running routes as I normally would. 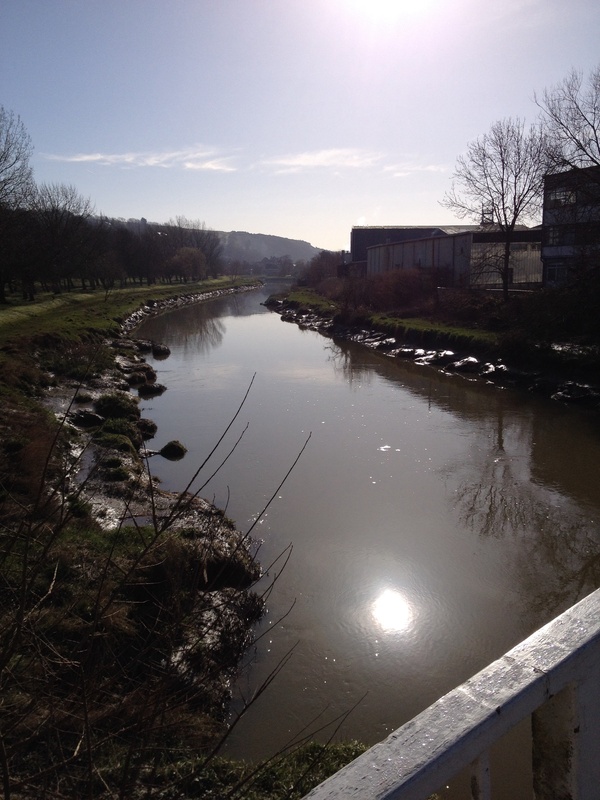 I decided the simplest thing would be to drive to Lewes and follow the river for a bit – no getting lost there I thought. I spent some time driving around Lewes trying to find a suitable parking spot, eventually parking in what must be the most expensive car park in Lewes. Being of not blasé enough a nature to waltz into Tesco and park there for three hours for the price of a can of Coke. After jumping through the various hoops of parking – phoning up to pay, downloading the parking app etc – why us everything so complicated these days? 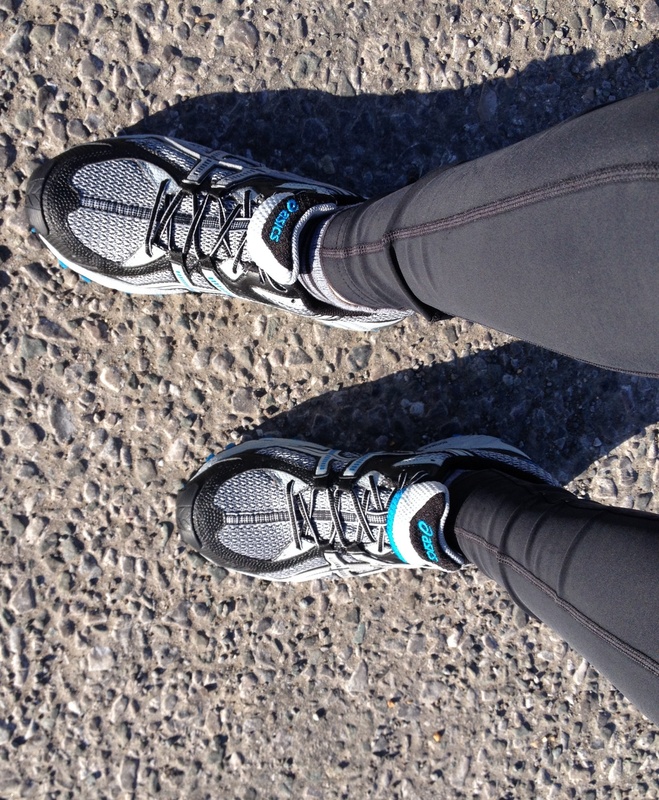 I finally changed into my new off-road running shoes (you may remember from the last blog that the previous pair were letting in small stones – ouchy, ouchy). These are goretex Asics bought from the Jog Shop in Kemp Town. 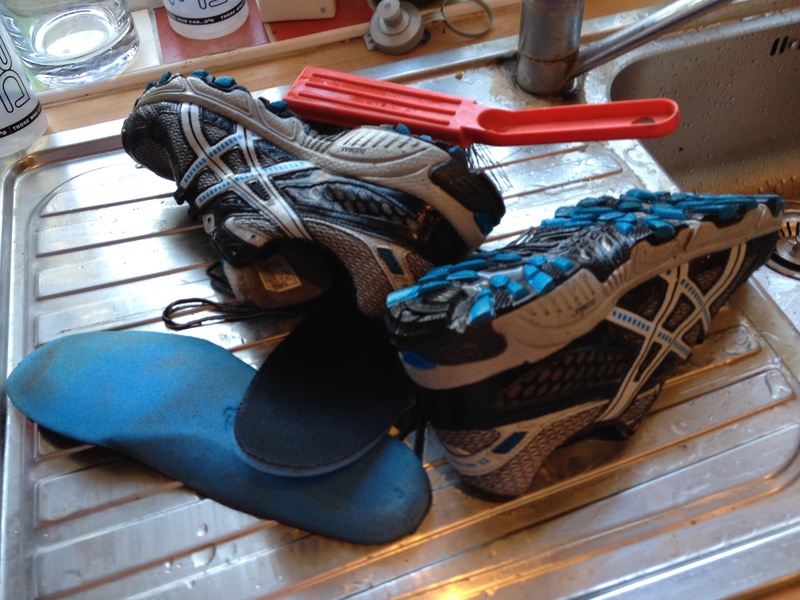 I love Asics trainers and have had several pairs – the husband thinks the Goretex may make my feet a bit hot, but I was blown away by the tiny pouch on the tongue in which I could poke my laces. 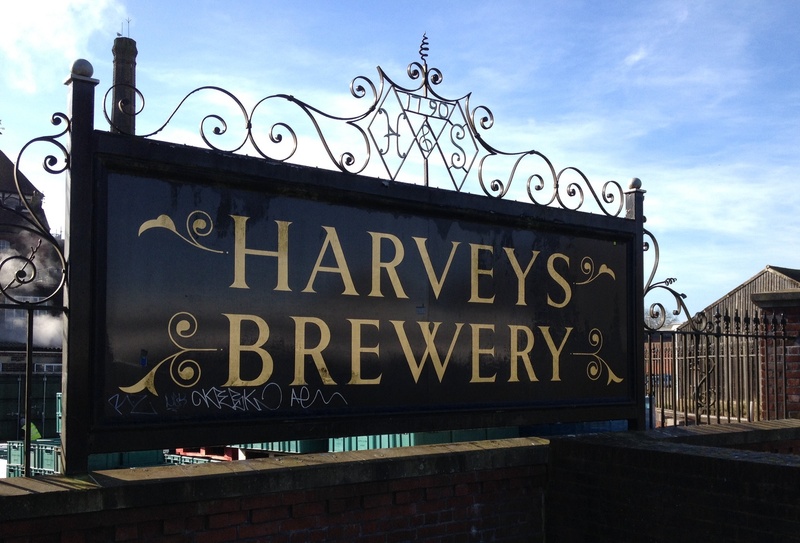 And so I started out, round by Harvey’s brewery – the delicious smell of the hops! 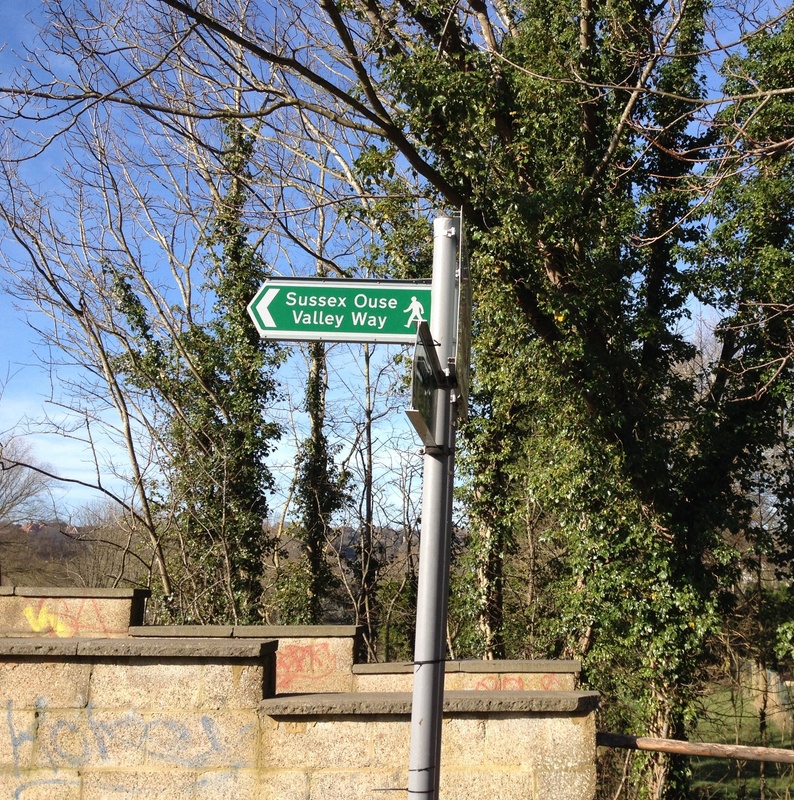 And through the park to the bridge, following the sign for the East Sussex Ouse. On the other side of the bridge it was a different story – immediately very muddy just as the husband had warned me it would be. At first I gingerly picked my way through the mud, trying not to mess my new shoes up, but after a few minutes I realised this was futile and just got on with it. The shoes faired pretty well – my feet did get wet, but not cold, and they didn’t come off in the sucky mud like the husband’s did on a previous version of this run. 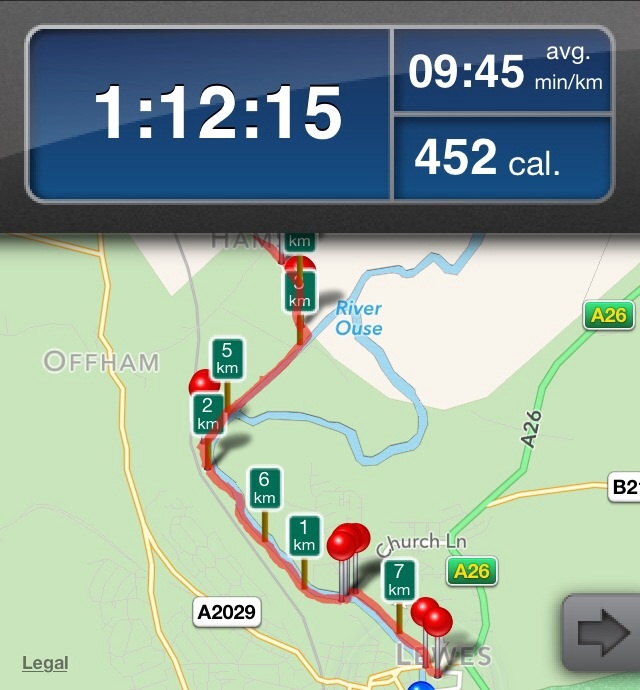 Difficult to run over such muddy terrain so it wasn’t a fast run. It was a relief to finally meet a track and then a road where I could practice some of the running techniques learned on the Kinetic Revolution workshop, including running with small circles, like running through snow, pushing the arms back and elongating the neck. Running with my mantra ‘push, push, pull, pull, back, back, back’. 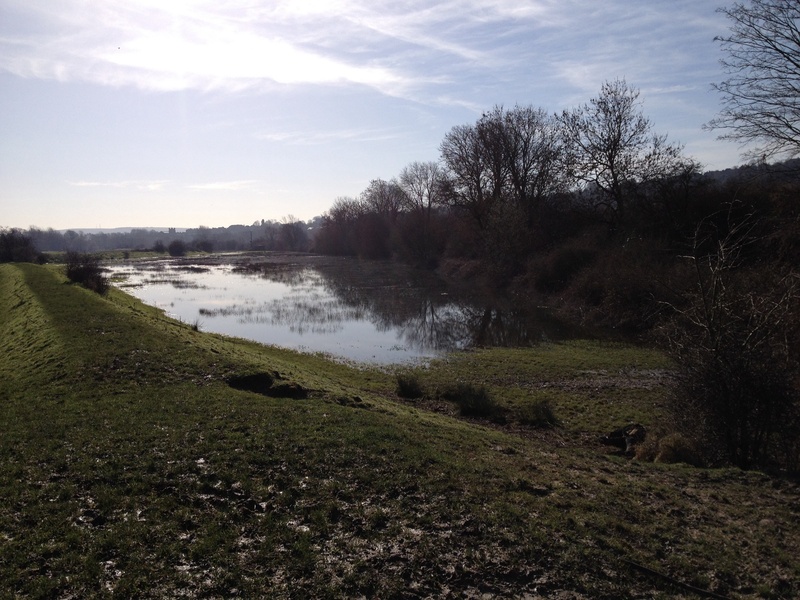 I met one other runner on the road who I warned about the muddy riverside, but he looked far too sensible to attempt off road today! Going back was quicker. 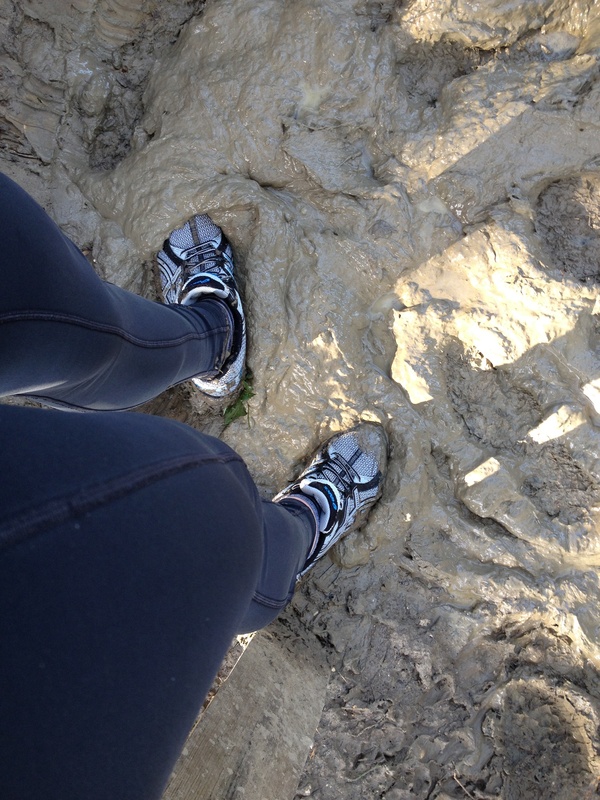 There was no stopping to wonder about the best way to get through the mud – I already knew that from the out. It was more a case of ‘this is the best way round’ or ‘just plunge in like a kid’ or ‘swing on this gate to get across’ . Back through the park I attempted to clean my shoes in a puddle to save on the cleaning work later. Walking back through the town, a mud-coated spectacle to the Wednesday shoppers, I sussed out where the public toilets were and made my way back to the car to change my shoes. Luckily in the boot of my (new!) car was a carrier bag for my muddy shoes (more luck than planning!) and I headed back to the public toilets with my bag of clean clothes to get changed. Being the mother of a disabled child has meant I have developed a skill of clocking local facilities and also of being able to perform a complete clothes change on a child in a small cubicle, therefore it was a simple matter to change out of my muddy things into clean jeans, dry socks and sweatshirt, ready for some coffee and reviewing. I decided I must not go to Bill’s, I must not go to Bill’s (I would have dearly loved to go to Bill’s but I know how good that is already) so instead focused on the Riverside – a collection of shops and cafés inside one building. 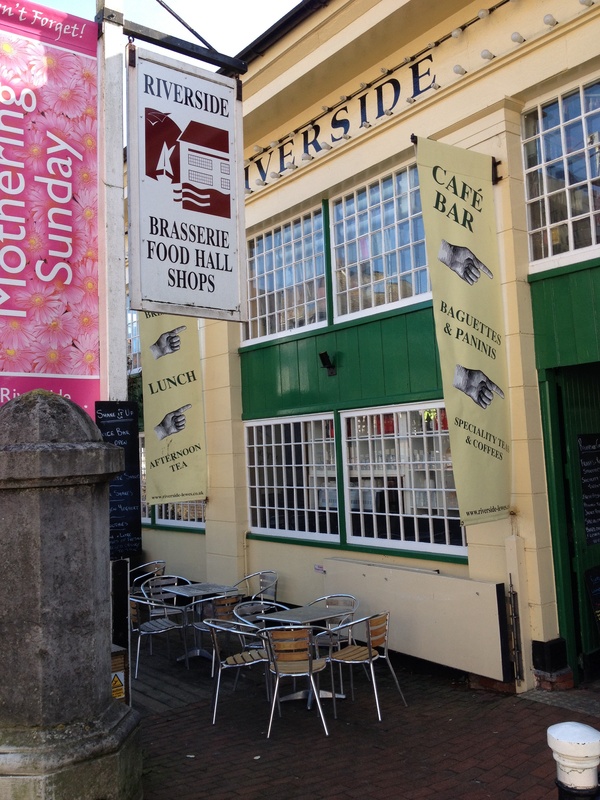 I began upstairs with coffee and cake at Riverside Brasserie -lovely views over the river, but the service was a bit slow and they forgot my cake! Regular customers flirt with the staff which adds to the entertainment. Also upstairs is an art framers with a lovely selection of cards (I bought several for the approaching birthdays) and a wonderful knitting and sewing shop with beautiful fabrics, wool, buttons, ribbons and sewing kits – if only I knew someone who would like a knicker-making set! Downstairs is a knowledgable, busy flower shop with bespoke bouquets, a juice and shake bar, a barbers, a sweet shop with pick and mix, truffles, foil wrapped individual chocolates like ladybirds, bees etc, and Terry’s fisheries: I bought some honey roast salmon which was quite expensive but was all cooked and could be eaten hot or cold so win win easy tea for me! I ordered some food from the downstairs cafe, they had a nice selection of sandwiches, paninis, pies etc, a vast selection of Tea Pigs tea (I bought the chai tea to take home) however the seating was a bit cramped – it was a mission to get in and out! 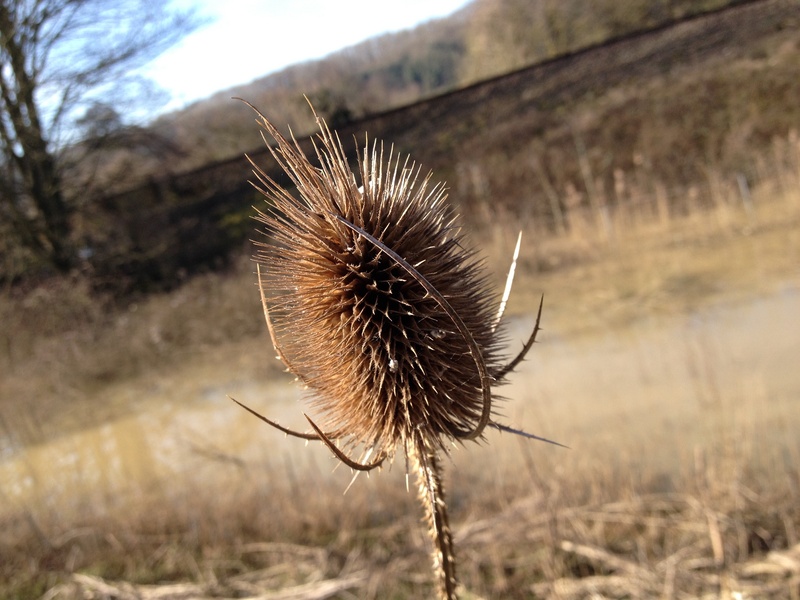 Ticks all the boxes: creative, fitness, connecting with nature, me-time…bliss!